Play video Is Mourinho the right man for Man Utd?Is Mourinho the right man for Man Utd? Play video Is Mourinho the right man for Man Utd? Play video Chelsea v Man Utd: Who's the favourite? Right, that's that from us but we've got three other games for you to choose where you head off to next. Bournemouth manager Eddie Howe, speaking to BBC Sport: "We were slow out the blocks today, which is unlike us. If you give a team like Arsenal time on the ball they will punish you. "We were much-improved in the second half without getting that goal to put them under pressure. We kept going, kept fighting, and if we had got that goal back with say 20 minutes to go, it would have made for an interesting finish. We got into some really good positions without the cutting edge we have had in recent weeks." Arsenal boss Arsene Wenger, speaking to BBC Sport: "We had a strong start, with good finishing and we controlled the game. We beat a good side, it was three difficult points but three very important points for us because we had not won for a while. "We lost a bit of our urgency in the second half. We lost the killer instinct to get the third goal and on top of that Bournemouth are physically a strong team. "It was a must-win game for us today. Leicester have made a big impression in the last week after their results. They suddenly become the favourite in the Premier League and it makes our game a big game." Arsenal midfielder Aaron Ramsey, speaking to Sky Sports: "The game was won in the first half really. The boys responded really well and we go back to winning ways. Hopefully we can keep this run going now. "I am pleased for Alex Oxlade-Chamberlain. It was a good performance from him today and hopefully he can keep up the form." Arsenal midfielder Mathieu Flamini, speaking to Sky Sports: "It was a good team effort. I am very happy for the team. We have a tough game next week against Leicester and we have to win it." Bournemouth have now met Arsenal three times in all competitions, losing each clash without reply (conceded seven). The Gunners are unbeaten in 23 fixtures against newly-promoted sides, winning 19 and drawing four. Mesut Ozil has now scored in both Premier League matches versus Bournemouth this season with both goals having been assisted by Olivier Giroud. 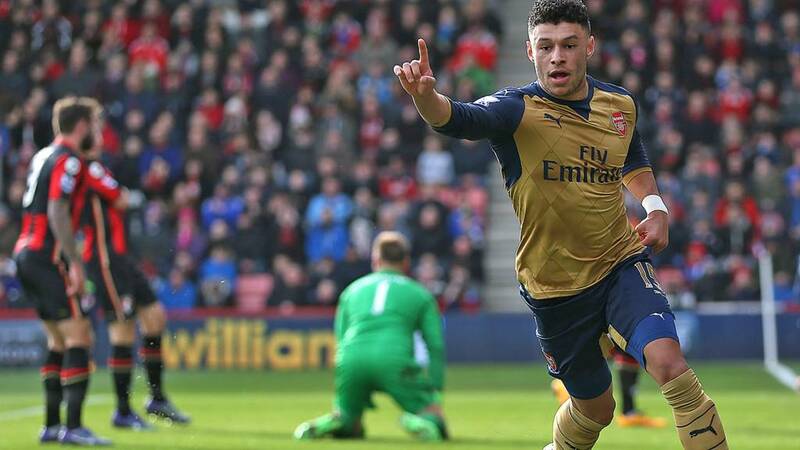 Alex Oxlade-Chamberlain scored his first Premier League goal in 38 appearances. It was his first goal involvement in 26 Premier League games (assist v West Ham 28th December 2014). Petr Cech kept his 12th clean sheet of the season; more than any other Premier League goalkeeper. Andrew Worby: Dont know why people are complaining, Bournemouth never looked like scoring. Asser Ghozlan: Back to winning ways, solid win, back in contention with the league leaders to come next week & above City, why the negativity? "Back to basics for Arsenal. Petr Cech made a huge difference with the clean sheet mentality and nothing went past Gabriel. After going 2-0 up in the first half it was an old-fashioned display of defensive quality. And the same again might just work well for them against Leicester next week." The defeat for Bournemouth, meanwhile, means they remain in 15th, five points above the relegation zone. James C: Good to climb a place today but still below Spurs and still with a dodgy goal difference. "Arsenal will feel they have done all they needed to. Bournemouth opened them up on a few occasions but Arsene Wenger's side deserve the win." Three important points for Arsenal as they get their stuttering title challenge back up and running. They are third, but are level on points with Tottenham in second. Andrew Hook: Poor second half performance this. Arsenal should be going for goals and taking some momentum into next week. "Dear me. Great chances, both firmly struck, but you can't argue with saves like that when you're hitting the target." Theo Walcott is on for Olivier Giroud for a 30-second run about. Arsenal fail to clear a cross and Steve Cook's low drive is blocked on the line by Petr Cech's leg, before the keeper gets up to claw away Harry Arter's follow up. Crucial saves. Arsenal, though, hit back with a swift counter but Aaron Ramsey's shot is charged down by Artur Boruc. Josh King doesn't miss a cross this time, meeting the ball with his thigh but the effort is straight at Petr Cech. "I was waiting to see the ball nestle in the back of the net - but it just went straight past Joshua King's forehead!" Dan: This is exactly why Arsenal won't win the league, we just can't kill teams off and control a game. As I finished typing that previous message, Bournemouth were not far off from pulling one back. Junior Stanislas sent in a perfect ball that just shaved the top of Josh King's head. So close.